Oink Pig is hand made in the finest pink cuddly soft plush. 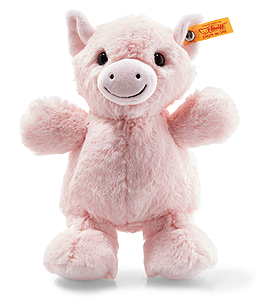 Soft Cuddly Friends Oink pig is 22 cm tall and made of soft and cuddly pink plush fabric. The soft snout has embroidered brown nostrils and a smiling, embroidered mouth. Oink pig has funny ears which stand out and a small, curly tail. That makes him perfect for the little hands of children to grab and hold on to. He is not only inviting to play with, but also serves as a cute snuggle buddy.